A constant theme in the Investment Analysis Report has been to expect the market to move in the opposite direction of the positions of day traders. This has proven successful with regards to the Japanese Yen, the U.S. dollar and the Treasury Bond. Therefore, we were very interested in the New York Times article Day Traders 2.0. We expect that day traders, who are now buying stocks, are again on the wrong side of the trade. The New York Times provides some statistical research on a day traders’ success rate. Not surprisingly, in a “yet-to-be-published study conducted in Taiwan…the authors sifted through tens of millions of trades, from 1992 to 2006, and found that 80 percent of active traders lost money.” With that kind of win/loss ratio, it is no wonder that “’only 1 percent could be called predictably profitable,’ says a co-author, Brad M. Barber, a finance professor at the University of California, Davis.” A day trader’s failure is as close to a statistical certainty that you will find in this life. These speculators show up en masse when they are most comfortable investing, which turns out to be at the end of a trend. As the NY Times concludes, the day trading philosophy “is a Newtonian principle formulated more than 300 years ago: a body in motion tends to stay in motion.” Price momentum reinforces herding and blinds speculators to any trend change. While that particular comparison was deemed extreme at the time, the Shanghai index fell roughly 70% during the 2007-9 crisis. China has since traded a stock market bubble for a real estate mania. 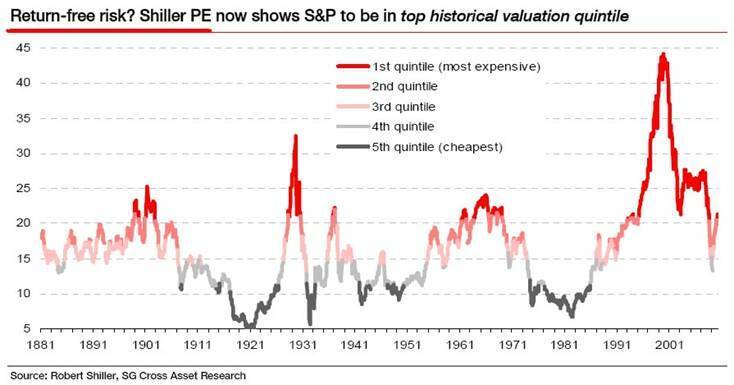 The chart below shows the P/E ratio in its highest quintile, which according to Grice implies a 1.7% annual return over the next 10 years. At these valuations, the stock market reminds us of the 30 yr-Treasury Bond back in December of 2009. At that time, the Treasury was offering investors a mere 2.5% annual return on your money for 30 years. Ninety-nine percent of day traders surveyed thought this was a good deal then. Of course, they were wrong. Bond prices went down 20% and the government now offers a 4.7% yield for 30 yrs. In our view, buying the S&P500 for a 1.7% return over the next 10 years is a similarly bad deal. But the day traders are loving it once again. “By December 30, 1929, the stock market was happily on its way to regaining a third of its losses. Enough confidence was restored that the so-called Crash was knocked off the front page of Barron’s by a crisis in South American Bonds. That the Dow Jones Averages didn’t reach a low point until 1932, three years after the supposedly disastrous date, should be very reassuring to us all. There was plenty of time for the investing public to sell its stock and suffer a normal setback - a 50 percent loss at the most.” A Fool And His Money: The Odyssey of an Average Investor. John Rothchild, 1988. Unfortunately, few did. Most sold in the Panic of 1932, when the market was down 85%.